Eurocom Corporation (www.eurocom.com), a leading developer of high performance Mobile Workstations and Mobile Servers is shipping a complete line of Mobile Workstations built with high quality mechanical designs and high performance components to thrive during the rigours of professional on-the-go deployment. “Eurocom Mobile Workstations are unlike typical consumer notebooks, and even other mobile workstations in that they are built from the ground up to be of a higher quality design to go along with a full complement of extremely stable professional grade components” Mark Bialic, Eurocom President. Eurocom Mobile Workstations are built to offer unmatched performance, long lifespan and full upgradeability of the processor, memory, storage, operating system and GPU technology, and are designed with the most innovative technology and components available. Upgradeability is built in to every Eurocom Mobile Workstation to give our customers a myriad of benefits, such as the ability to customize the configuration of their system at the time of purchase to meet their exact needs. As well as the ability to reconfigure their system well after purchase with new components for different application requirements. Customers also have the ability to upgrade their system with newer, higher performance internal components for a performance boost to increase the capability and lifespan of the workstation. Eurocom Mobile Workstations are built around a 12 layer motherboard which improves signal quality, and aids in the decoupling of the power bus, resulting in high quality electromagnetic compatibility and superior motherboard quality and performance. A twelve layer motherboard dramatically lowers system temperature and electrical waste, providing a more stable system. Using durable ABS plastics and top quality manufacturing technology, Eurocom Workstations strong chassis can be used for heavy duty computing while on the go by engineers and professionals. Eurocom systems are designed for the new breed of Engineer who must travel but still needs access to powerful, reliable and long lasting professional grade hardware. They are optimized for Engineering-on-the-go deployment with the best available technology. Eurocom Mobile Workstations are fully customizable to allow users to choose the exact performance level these desire to ensure the customer gets exactly what they desire. Driving the EUROCOM Panther series of Mobile Workstation is a complete line of 6 core and 8 core Intel Xeon Processors based on the LGA 2011 processor socket, up to Intel Xeon E5-2690 Processor. These high-performance CPUs allow users to simultaneously run multiple applications at the same time -- all with increased performance. Up to 32GB of superfast DDR3-1600 SODIMM memory is also supported via four channels in all Eurocom Workstations to increased performance during on the go deployment. Eurocom Workstations support a full line of professional graphics from NVIDIA including Quadro K5000M, K4000M and K3000M to give customers three distinct levels of performance. NVIDIA Quadro GPUs are designed and built to provide leading performance, reliability, compatibility and stability with applications like Adobe Creative Suite 5.5, Autodesk 3DS Max, Autodesk Autocad 2011, Autodesk Inventor 2012, Avid Media Composer, Dassault Catia, Dassault Solidworks, Siemens X, ANSYS, MATLAB, Dassault Simulia, among many others. NVIDIA Quadro K5000M is ideal for professional applications such as video editing, color correction, compositing, design visualization and GPU-accelerated ray-traced 3D rendering. The NVIDIA Quadro K5000M, with a massive 4 GB DDR5 of Error-Correcting Code video memory and 256 bit bandwidth, users can display extremely complex scenes and models as well as calculate large datasets with ease, on the go. ECC memory detects and corrects common types of data corruption, offering uncompromised data reliability. Eurocom Mobile Workstations support Solid State, Hybrid, or Enterprise level drives with RAID capability. With support for up to four 1 terabyte storage drives, the Panther 4.0 is able to offer 4 terabytes of storage. RAID 0,1,5,10 capability gives users the ultimate in performance or redundancy. SSD drives in particular will benefit from the use of the SATA 6Gbp/s standard available on 2 ports, eliminating bottlenecks for the fastest SSD drives. For the most demanding customers Eurocom offers the highest performance Intel and Micron SSDs including the new Intel enterprise SATA 6Gb/s Intel DC S3700 800GB HET MLC SSD. EUROCOM Panther uses quad channel memory, and enables it to initially support up to 32GB of DDR3 1600MHz RAM via four 8GB SODIMM 204 pin modules. Eurocom professional mobile Workstations offer substantial display options, internally and externally. Eight display options are present with the ability to have it professional calibrated for colour accuracy as well as a 120 hz 3D enabled panel. External display connectivity is offered through HDMI 1.4a, Display Port 1.2 and DVI-I ports. 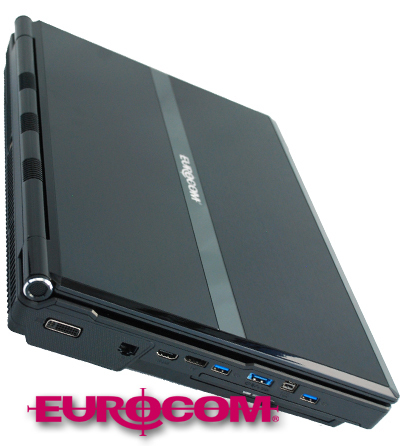 Eurocom Workstations support a wide range of connectivity and expansion technologies, such as USB 3.0, Firewire 800, Expresscard 34/54, eSATA, HDMI 1.4a, Display Port 1.2, DVI-I in addition to several others to ensure the workstation can be connected to a plethora of external technology. Eurocom Engineers test and verify Eurocom Workstation systems to verify performance, quality and capability of a wide variety of configurations. We save and supply these numbers for our customers so they can find the configuration and performance level that fits their needs. Below you can find the EUROCOM Panther benchmarked with the three levels of supported NVIDIA Quadro graphics processors.